Nice - Smoothie: Smoothie is a fruit refreshing and healthy drink. Smoothie is a fruit refreshing and healthy drink. We choose only fresh and fine fruit and berries. There are lots of smoothie recipes. In our pastry shop “Nice” we use only natural fruit and berries to make it. The main smoothie ingredients are good for your health: berries, vegetables, fruit. And ice is an almost indispensable ingredient. It can be made not only from fresh fruit but also from frozen ones. For example we add homemade fruit sorbets in our smoothies. No matter what ingredients you use they should be all mixed together in a blender. This drink is extremely popular with those who keep a healthy diet. Moreover, this fruit drink is so refreshing on a hot summer day. It is not only a nice dessert, maybe still a little exotic, but it can be a main course as well for lunch or dinner, especially if it is made of natural berries. 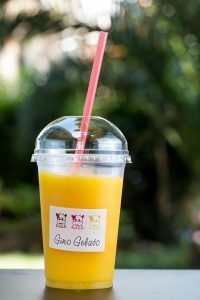 In our French coffee shop in Gino Gelato menu we offer a wide selection of these perfect for summer, refreshing and healthy drinks. The most popular flavours are banana, strawberry and raspberry, black currant, lemon. And all this is made for you from the finest and the freshest ingredients.